Thiruvananthapuram is one city of Kerala that is marked with luring beaches, alluring temples, heritage monuments, Majestic Palaces, stunning backwaters, coffee, spice and tea plantations and rich cultural glory. No wonder it is one of the most popular tourist destination. Another attracting feature of the city is that there are innumerable luxurious accommodation facilities to stay in here. 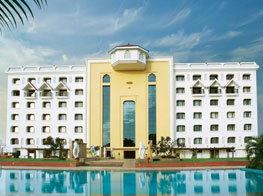 Here the stunning backwaters that overlook these hotels offer breathtaking sceneries to one and all. Replete with gifts of nature, the guests simply lose themselves in the surrounding beauty. The beach resorts in the city give tourists a chance to enjoy a lot of beach activities such as snorkeling, swimming, beach sports and sun bathing. The guests also get to enjoy the relaxing Ayurvedic spa treatments and massages in here for which the city has earned special kind of reputation for. The religious temples and cultural monuments in Thiruvananthapuram are very popular among travelers. Hence hotels here are strategically places nearby major monuments and temples so that the guests can make easy excursions. Check out the detailed description of Thiruvananthapuram hotels and decide for yourself the hotel that catches your fancy.